Have you imagined a crossover with LED daytime running lights to alert your presence to other drivers? A vehicle with Eco Mode for more efficient driving? An automobile with a 2.5-liter, DOHC 16-valve, 4-cylinder engine? Well, you can stop imagining because the 2017 Nissan Rogue available from Vann York Nissan near Winston-Salem, NC, is real! Visit our Nissan dealership and drive home in a new Nissan crossover that offers MP3/WMA CD playback capability, auxiliary audio input jack, and USB connection port for iPod interface and other compatible devices all standard. On the chance you're looking for a Hybrid crossover that comes equipped with a 4-cylinder engine and electric motor powered by a lithium-ion battery, then the new Nissan Rogue SV Hybrid is the clear choice for you. To climb into a new Nissan Rogue and try these features out for yourself, contact Vann York Nissan near Winston-Salem, NC. The sales associates we employ know the trim options on every vehicle available at our car dealership near Greensboro, NC, and will walk you through the available options on your next new Nissan Rogue! If you are someone who enjoys a leather-wrapped steering wheel, then you'll want to be sure to check out the Rogue SV Hybrid when you arrive at our Nissan dealership near Greensboro, NC. While you're here, be sure to speak with our finance agents about the finance packages we provide. The outside of the new Nissan Rogue features as many things on the outside to talk about as it does on the inside. For starters, this new crossover offers Halogen headlights, LED taillights, and LED daytime running lights, so your path is sure to be illuminated whether it's day or night. If you want fog lights, then you should try out the Nissan Rogue SL. Since you're interested in a crossover, you likely have a taste for the outdoors. Take in nature through the optional panoramic moonroof available on the Rogue SV Hybrid. Routine maintenance is paramount to preserving the enjoyment and reliability you receive from your Nissan every day. That's why our Nissan dealership is here when you need to schedule service for any maintenance your car may require. 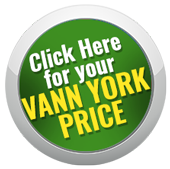 When you want an affordable price on a new Nissan Rogue, visit Vann York Nissan near Winston-Salem, NC, today!